This Windows Vista tutorial provides step-by-step instruction on how to tweak the Flip 3D feature to boost performance and speed up your system. Read on to learn how. Windows Flip 3D is another nifty feature unique to Windows Vista. It is an updated version of the ALT+TAB feature of previous Windows versions, providing a quick and easy way to switch from one window to another. 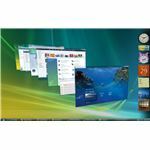 Flip 3D displays live thumbnails of your open windows on your desktop, in a three-dimensional stack. While it is intuitive and convenient, this feature is a drain on your system resources. What’s more, if you have an older or low-end video card, you may suffer dropped frames, which would result in a jerky, sluggish animation as you flip from window to window. You can speed up the operation of Flip 3D by limiting the number of windows that it stacks on your desktop. Read on to learn how to speed up Flip 3D using a simple registry hack. Click on the Start button in the bottom left hand corner of your desktop. Type: regedit into the Start Search box and press the Enter key. This will launch the Registry Editor. Next, create a new DWORD value, and then label it as Max3DWindows. Set this value to the maximum number of open windows that you want displayed at a time. Take into account the level of performance of your graphics card. For example, set it at 4 or 5 if you are experiencing serious performance issues. Experiment with different values until you find one that gives you optimal results for your hardware. Close the Registry Editor. Reboot your computer. Once you complete this hack and reboot, Flip 3D will perform faster and render smoother animations. It will also limit the number of windows it will display, based on your specified setting. CAUTION: As with any registry tweaks that you want to perform, always conduct a backup first, and then proceed with great caution! If your hardware does not meet Vista’s minimum specifications, or if you simply do not have much use for this feature, you can easily disable it. Click on the Start button, and select Control Panel from the Start menu. Click on Administrative. Click on Group Security Policy. Locate Computer Configuration in the left hand panel. Expand it and navigate to Administrative Templates. Click on Windows Components and then Desktop Window Manager. Save your new settings and exit. Your Vista system will now be relatively faster and more responsive. Want to speed up your Vista PC? This series will tell you how - from the basics to more advanced techniques. Soon you'll have your Vista PC humming along in tip-top shape.